This “mid-bay” gate would be tied to an extensive network of man-made reefs and island berms, most of which already exist, to safeguard not only industry along the Ship Channel but also homes in rapidly developing areas such as League City along the west side of Galveston Bay. See here, here, and here for the background. Credit where credit is due, Bush is the first public official to get behind this idea, and if he can take it somewhere it will be a good thing. Cost has always been the main obstacle, but as the Trib reminds us, it’s not the only one. Everything about the $2.8 billion plan from the Severe Storm Prediction Education and Evacuation from Disasters Center, or SSPEED, screams compromise. The proposed location is roughly halfway between the upper-bay Centennial Gate and the lower-bay Ike Dike — and borrows certain features from the latter, including some new levees and elevated roadways. Its estimated price tag also falls somewhere in the middle, but closer to the $1.5 billion Centennial Gate than the $4 billion to $8 billion estimate for the Ike Dike. 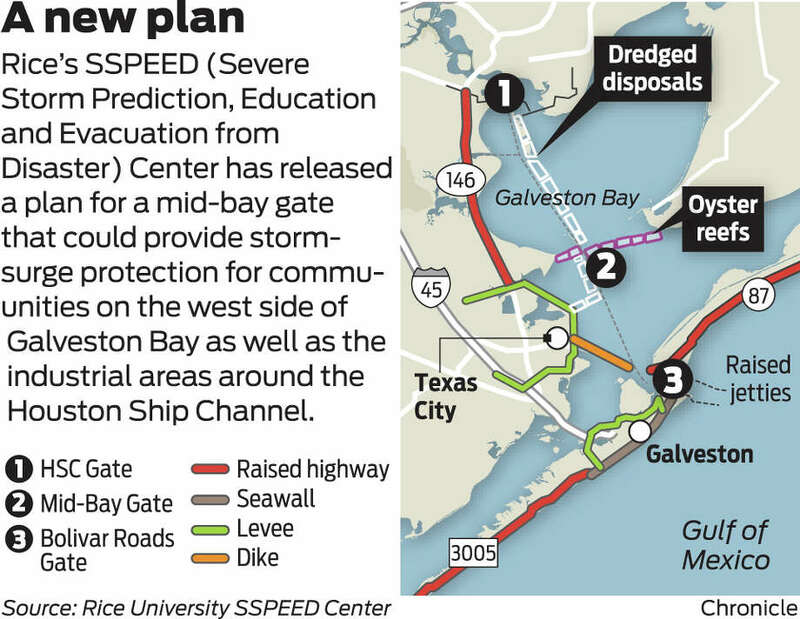 The “mid-bay” plan — contained in the first of three annual reports from the center, and so far lacking a catchy moniker — calls for installing a storm surge-deterring gate as tall as 25 feet across the nearly 700-foot-wide Houston Ship Channel near the community of San Leon. The manmade channel connects the Gulf of Mexico to the Port of Houston, the busiest seaport in the U.S. by some measurements. Sometimes compromises satisfy everyone, and sometimes they piss everyone off. If this is more the former than the latter, then there ought to be some consensus to move forward, however slowly, towards a funding mechanism. If not, I figure we’ll see another story about another floodgate being proposed sometime next year. We’ll see how it goes. Will we build the right Ike Dike?